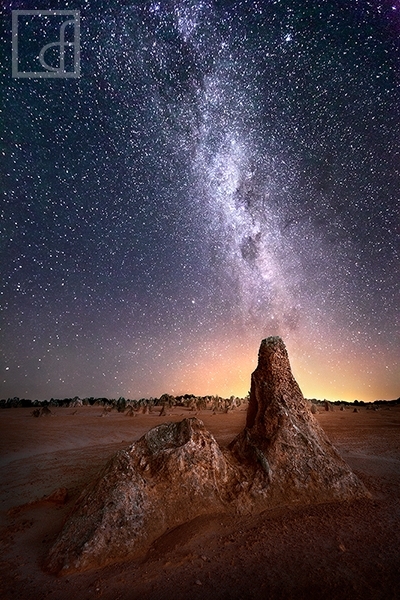 The Pinnacles are located just outside Cervantes, Western Australia. They are part of Nambung National Park. The limestone formations are stunning and easily accessible, only a 2 hour drive north of Perth. After my first visit to this location I had to return the following month at the same moon phase. I was loved the vision behind my first attempt but it had some technical imperfections that I needed to fix. The conditions on the second trip were exactly how I wanted them. I arrived a short time before sunset and remained there for the next 3 hours. It was amazing to watch the sunset, see the Milky Way come out in full force, and then fade again as the moon rose. There was certainly a lot of sitting around and waiting involved, but I think it was worth it. Nothing like watching the night skies open up. It is truly a whole other world! Secure your limited edition, Pinnacles photographic print, 'The Other World', by selecting your desired print size in the menu to the right.